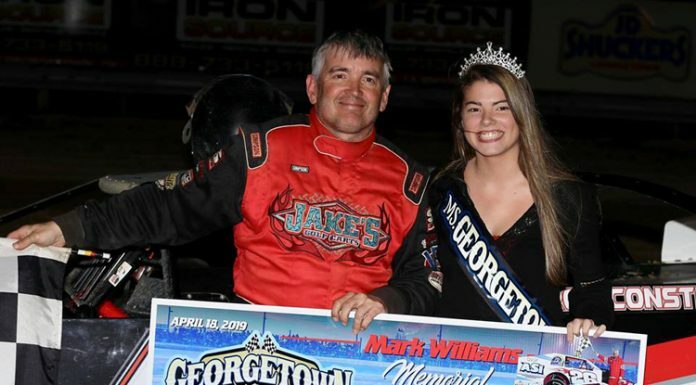 BREWERTON, NY – Max McLaughlin came out victorious at Brewerton Speedway after a duel with Larry Wight, taking the lead on a late restart and hanging on for his second checkered flag of the year. 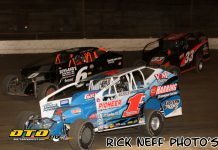 Roy Breshanan took control at the start of the 35-lap Modified feature, leading early over Andrew Ferguson and Larry Wight. Bresnahan held a slim lead for the first handful of laps, with Ferguson and Wight battling for second right behind. On lap nine, Bresnahan slipped up on entry, and the duo behind him pounced. Wight went low, Ferguson high, and the front trio went three wide for the lead. Once past Bresnahan, Ferguson led the next few laps before Wight threw a slide job for the top spot on lap 12. Once in front, Wight began to pull away. Behind Wight, Tim Sears Jr. was also charging forward. On lap 20, Sears darted to the bottom and slid under Ferguson for second, but his time in the runner up spot was short lived. Just a lap later, Sears was passing the lapped car of Roy Shields, but Shields made contact and sent Sears spinning. The yellow meant Wight’s three second lead was now gone, with Ferguson and Max McLaughlin lining up behind. On the restart, McLaughlin got a great bite and launched into second, but couldn’t find enough on the bottom to get by the high-flying Wight. With 23 laps completed, Tim Kerr got booted exiting turn four and was sent spinning into the pack, collecting a number of cars. Pat Ward, Katelyn Hile, Tim Sears, and Robby Bellinger were among those collected, with Bellinger landing on top of Sears’ car. Wight chose the bottom lane for the ensuring restart, placing McLaughlin up high. McLaughlin made friends with the cushion and put his foot to the floor, driving past Wight and into the lead. After the pass, Wight went back to the top and didn’t let McLaughlin get away. After a couple laps, McLaughlin began experimenting with the bottom, allowing Wight to get even closer. With four laps to go, Wight showed his nose up high, and McLaughlin quickly switched lanes to defend. Over the final few laps, Max McLaughlin was able to keep Larry Wight at bay en route to his second win of the year. 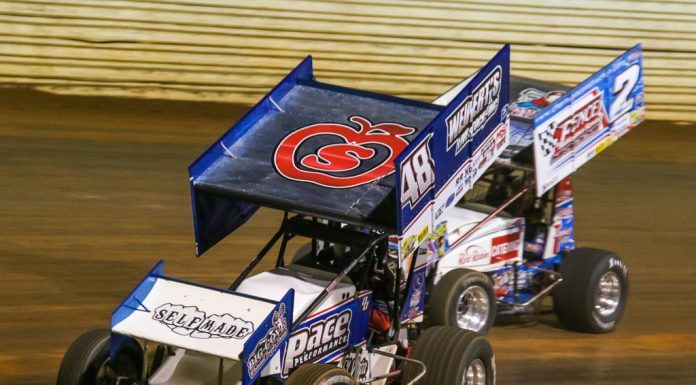 Behind them, Chris Hile, Jimmy Phelps, and Chad Phelps completed the top five. 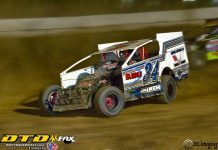 Once Nick Krause got out in front during the first Sportsman feature, nobody had anything for him, as Krause rolled away to his fourth Brewerton win of the year. In the second main, Corey Barker was able to withstand a late charge by Kevin Root to grab the checkered. 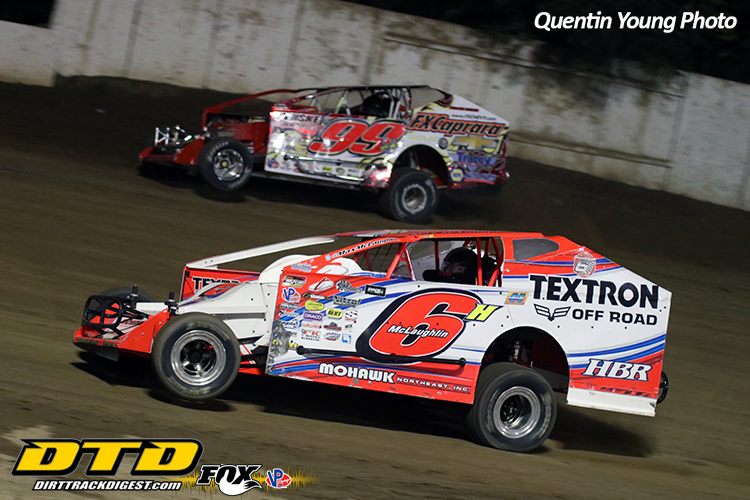 Justin Williams scored Mod-Lite win eight on the season, this time having to hold off father Doug in a narrow finish. Evan Wright made the 4-Cylinder finish not so close, dominating the 15-lap feature and winning by over a straightaway. (SUNY Canton DIRTcar Sportsman #1 25 Laps) – NICK KRAUSE, Alan Fink, Willy Decker Jr., Billy Clark Jr., Chris Mackey, Jim Spano, Zach Sobotka, Joe Abbass, Mike Button, Joey Buonagurio, Chris Bonoffski, Tyler Corcoran, Robert Gage, Brian Evenden, Rich Townsend, Mike Fowler, Jake Petit, Tony Finch II, Amy Holland.